Published in 2015 by University of North Texas Press. From the title of this book, one might conclude that it concerns itself only with the tragic events of November 2009 at Fort Hood, Texas. Although it addresses these matters in carefully researched detail, perhaps its greater contribution is in its comparative analysis of this attack versus other rampages in the United States intended to inflict mass casualties. Examples of two such cases familiar to Austin readers are the Charles Whitman University of Texas tower shootings in August 1966 and the Joseph Stack aerial assault on the IRS offices in the Echelon building in February 2010. After Hasan graduated from high school, against his parents’ wishes, he joined the Army in 1988. Ultimately, Hasan’s decision to join the Army, coupled with his eventual radicalization, played a significant part in the events that led up to the Fort Hood massacre. After he enlisted, the Army permitted Hasan to go on inactive duty to pursue a college education. He graduated from Virginia Tech with honors with a degree in biochemistry in 1995. In 1998, his father died and his mother followed in 2001. Hasan had always for the most part, looked to his parents for guidance and was cast somewhat adrift after their deaths. Before his mother died, however, she told him she wanted him to “know God.” Subsequently, Hasan started praying more and became more pious. After the World Trade center attacks on September 11 and the American invasion of Afghanistan that followed, Hasan, along with many other American Muslims took abuse from revenge-minded segments of the American public. After graduating from Virginia Tech the Army sanctioned Hasan’s enrollment in the Uniformed Services University of the Health Sciences at Bethesda, Maryland. He graduated in 2003 and was promoted to the rank of captain. He stayed on at Walter Reed for his internship and residency, with a specialization in psychiatry. By the time of his graduation from medical school, he was already firmly committed to the study and practice of Islam. Now, recognizing what he perceived to be the Army’s assault on his religion, he began exploring options for leaving the Army. The chief obstacle to Hasan’s departing the Army was its expectation that he repay the expense of his medical education. It was that or serve out his required seven years. He opted for the latter. During Hasan’s internship and residency at Walter Reed, he became more openly critical of the Iraq and Afghanistan wars. Also, he began proselytizing colleagues and telling those who knew little about Islam that they would “burn for eternity.” During his residency, Hasan was reprimanded for inappropriately holding religious discussions with patients. Also, he was put on probation for failure to show up for a required medical licensing exam. Despite Hasan’s abhorrent performance and suspect loyalty to his country, he was allowed to complete his psychiatric fellowship and promoted to major. His officer evaluation for the period ending June 2009 again demonstrated a disconnect between his reputed and his actual performance. The report praised, among other things, his “keen interest in Islamic culture and faith.” Any observation or hint of radicalism was conspicuously absent from the evaluation. Within two months, Hasan was on his way to an assignment at Fort Hood. At Fort Hood, Hasan’s main job in the Behavioral Health Department was to evaluate soldiers returning from Iraq and Afghanistan to assess their fitness for further assignments. The head of the department, Ltc. Ben Phillips had a reputation for being abusive to people under his command, and he did not like Hasan. One of the department workers had observed Hasan’s being brought to tears several time by rough treatment at the hands of his superior. It appeared to be difficult for Hasan to cope as he was an introverted loner who never took part in office functions. Two weeks after arrival at Fort Hood, Hasan purchased a Belgian-made semi-automatic pistol, with which he began practicing several times a week. It was small, light-weight and could be concealed in a pocket or belt. On November 4th and 5th, Hasan cleaned out his apartment and shredded documents including his medical school diploma. The morning of the second day, he drove to the Behavioral Health Department where he worked. He attempted to see his superior officer, but his being out-of-state that day saved his life. Hasan attended noon prayers at his mosque and then returned to his office where he put a .357 handgun in his right front pocket and his Belgian pistol in the waistband of his pants. He then returned to the Soldier Readiness Processing Center. After a few minutes there, he shouted “Allahu Akbar” and began shooting. At the end of that bloody day, Hasan had fatally shot 13 persons and injured more than 30 others. 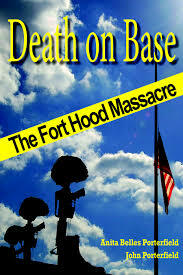 For those who wish to know more about the Fort Hood massacre, Death on Base is a highly commendable, carefully written study of those events. Ron Hunka has published over a dozen articles on castles and monasteries in the German-speaking world. In addition, he has documented the fraudulent careers of notorious Texans Billie Sol Estes, Frank Sharp, and James Bowie. Other subjects include the Spanish shipwrecks of Padre Island, the financial difficulties of the Republic of Texas, and the Nome Gold Rush. Thank you, Ron, for a wonderful and thoughtful review!